Shivanasamundram means Shiva's Sea and this place is located near Mysore in Karnataka. Offering many attractions and activities, it is a tourist destination that is emerging fast on the travel map of India. 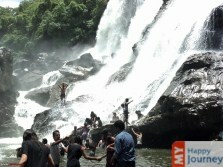 The Shivanasamundram falls can be visited throughout the year but the best time to visit the city is from the month of August till the month of February. During these months, waterfalls are full and their beauty can be enjoyed to the maximum. In the summer season, the weather is pleasant and warm and is well suited to enjoy different water sports, as well as visit numerous waterfalls. Winter season offers pleasant climate with the temperature ranging from 12ÃƒÆ’Ã¢â‚¬Å¡Ãƒâ€šÃ‚Â°C to 31ÃƒÆ’Ã¢â‚¬Å¡Ãƒâ€šÃ‚Â°C. Monsoon season offers low amount of rainfall but Shivanasamundram looks very beautiful during the monsoon season. Visitors can choose the weather that they like the most and enjoy themselves at the Shivanasamundram falls to make their trip an unforgettable one. November to February- Temperature lies between 12°C to 31°C for most part of the season thus the weather remains pleasant. Different outdoor activities can be enjoyed by everyone during these months. April to June-Summer season brings along pleasant and warm climate. This season can be opted for making a visit with friends or family because incredible natural beauty can be enjoyed around this time. July to September- Monsoon season lies from the month of July to September. The falls are full during this time and look very attractive. Different festivals are celebrated in this season. Moderately Cold The month of January offers moderately cold climate. In this month, a trip to Shivanasamundram can be planned and different tourist attractions can be enjoyed. The Vaidyanatheshwara Temple can be visited to seek the blessings of god. Various other places that lie in the vicinity can also be explored in this month. Woolen apparels should be carried along to enjoy the trip. Moderately Cold The weather during the day remains comfortably cold while the temperature during the night may experience a dip, making the weather quite cold. Different adventurous activities like trekking and water rafting can be experienced during this month. This month is generally preferred by the tourists for making a visit to Shivansamundram. Shivaratri being one of the main festivals is celebrated with huge pomp and show in this month. Moderately Cold Weather in the month of March remains comfortably cold, therefore making it a preferred time for planning a visit to the town. Nature lovers who like wildness and calmness are attracted to Shivanasamundram for its beauty and the adventure activities this place has to offer. Different fishing camps also attract the attention of the tourists. Pleasant With the weather remaining pleasant in the month of April, different activities such as Coracle rides, camping, rock climbing can be experienced in the city of Shivansamundram. When indulging in any kind of activity, make sure to wear proper gear so that the sports can be enjoyed to the maximum without getting hurt. Pleasant Weather in the month of May remains pleasant with the temperature ranging from a maximum of 25ÃƒÆ’Ã¢â‚¬Å¡Ãƒâ€šÃ‚Â°C to a minimum of 19ÃƒÆ’Ã¢â‚¬Å¡Ãƒâ€šÃ‚Â°C. Nature lovers will enjoy their visit to Shivanasamundram as they can witness different species of birds and turtles that are present in the town. This is a preferred time for planning a visit, if you love being outdoors. Very Cold Light woolen clothes and umbrella is required during this time as the month offers pre monsoon showers and a dip in the temperature is also observed. Extra care of small children and aged people should be taken to protect them from cold weather, as this month is regarded as the coldest month of the year. Rainy This month marks the beginning of monsoon season and light monsoon showers are experienced in the city. The waterfall looks very beautiful and attractive when it becomes full after a rainfall. Use of rain gear is recommended when travelling in this month. People who love rains should plan their trip in this month to enjoy the beauty of the city. Rainy Throughout day time the sky remains overcastted with clouds, with the sun rarely shining during this month. Rainfall can be experienced at any time of the day. The level of humidity is high in the atmosphere because of the rains. Different fairs are organized by the local residents, while hotels and resorts offer various discounts to attract tourists towards the city. Rainy The weather remains pleasant due to occasional rainfall that is received by the city. Tourists can get involved in different festive celebrations that are held in this month. These celebrations are very engaging and tourists can enjoy themselves by being a part of these festivities. Pleasant Dussera celebrations are in full swing during this month. This festival is celebrated in an extravagant way and marks the victory of good over evil. This month offers pleasant weather and light cotton clothes are preferred. A visit to the Barachukki Falls would be a good idea because of the beautiful scenery surrounding this place Barachukki Falls looks very fascinating. Pleasant Cool breeze blows throughout the month, making the weather enjoyable for tourists. Visitors who plan their visit in this month can enjoy the beauty of the place as the city looks fresh after the rains and the waterfalls are flowing full, making the view beautiful to look at. Being in this city is a great way of leading a healthy life away from the pollution of big cities. Moderately Cold Tourists can plan their visit in this month and especially enjoy visiting the Cauvery Wildlife Sanctuary. This Wildlife Sanctuary is well known for different species of birds and animals present here. The city looks very magnificent due to the presence of numerous waterfalls and rivers. A trip to this city with oneÃƒÆ’Ã‚Â¢ÃƒÂ¢Ã¢â‚¬Å¡Ã‚Â¬ÃƒÂ¢Ã¢â‚¬Å¾Ã‚Â¢s family or friends can be a memorable one.